Shirley B. Lashomb, 87, of Auburn was the wife of the late Ivan “Red” Lashomb. Shirley passed away peacefully on Saturday March 30th at The Commons. Shirley was born in Massena NY on June 24,1931 to Andrew and Marie Ida Balasy. She was predeceased by her parents and her husband Red and her beloved sister Lillian Edgley. Shirley retired from GTE Sylvania in Camillus NY after 25 years of working in accounts receivable. She was a kind and compassionate person, a loving wife, mother and grandmother. She loved to cook, especially her spaghetti for special occasions and holidays. Shirley enjoyed music and dancing back in her dancing days. She enjoyed trips to Florida to see her sister’s family and she enjoyed a nice summer night out on her back porch with friends and family. Shirley is survived by her son Andrew, grandchildren, Marc Lashomb, Ryan (Tiffany) Lashomb, and Meghan (Kris) Corey. 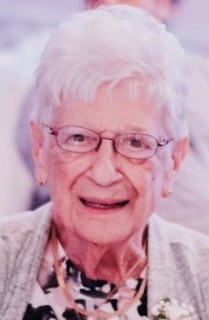 Shirley was especially close with brother in-law Joe Edgley and her niece Linda Edgley. She is also survived by several nieces and nephews. She will be missed by devoted friends Judy Wright and her husband Larry Jones, Vicky and Joel Meyers. Family and friends are invited to Shirley’s Mass of Christian Burial Thursday April 4, 2019 at 11:00 a.m. in St. Mary’s Church with calling hours commencing at 9:30 a.m. to 10: 45 a.m. in church. Friends are invited to join the family for a celebration of Shirley’s life at the VFW 44 E.Genesee St. immediately following the Mass. In lieu of flowers, contributions may be made to The Matthew House 43 Metcalf Dr. Auburn, NY 13021 in Shirley’s name.